Be sure to check it out, especially the "Images" slideshow. You'll find the rest, and any newly added segments, by going to YouTube and using "utech reading rainbow" as your search term. Sarah Vaughan, the jazz singer who performed many songs from "the Great American Songbook" [her recordings are found in the CD JAZZ collection] was born on March 27 in 1924. 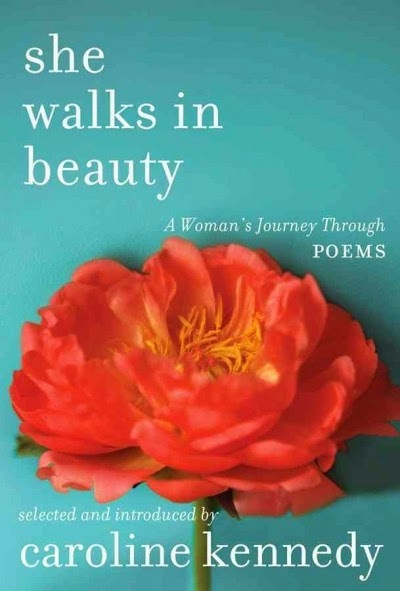 On this poetry Friday we're going to celebrate Sarah's role as a poetry lover. I was quite surprised to come across a mention of a recording she made in 1984 of the poems of Pope John Paul II, The Planet Is Alive...Let it Live! Who knew that such a recording existed? Of course, I checked YouTube and found a video of Sarah Vaughan in performance. Sarah Vaughan has even been the subject of a poem! To see the late Amiri Baraka performing it, click here. Jone, at Check It Out, is a fellow librarian who blogs on the west coast. Stop by for the Poetry Friday Round-Up! British actress, Keira Knightley, turned 30 today! You can read about the extent of her career here--it is truly impressive! In addition to the ones in our collection, the GMILCS libraries of our consortium have twice the number of movies in total! When doing a search in the catalog, be sure to pick "All GMILCS Libraries" from the drop-down menu under "Limit by." If you watched the video, you saw that it began with a commercial of sorts for Moffitt and Brown's new book, Asap SCIENCE: Answers to the World's Weirdest Questions, Most Persistent Rumors & Unexplained Phenomena [500 MOF]. The questions tackled in the book include the perennial favorites, "Which came first: the chicken or the egg? ", "Could a zombie apocalypse happen? ", and "Why does time feel faster as we age?" and more. The book has arrived here at the Library, and, I just put it out on the "New Books" shelf near the check-out desk! On this day in 1874, Erich Weisz was born in Budapest, Hungary. You might not recognize the name, but, Erich changed his name to Harry Houdini when he started performing. We have quite a number of books on Houdini in both the adult and children's biography sections. There are also books of fiction in which Houdini figures in the plot. The History Channel ran a mini-series, Houdini, last fall starring Adrien Brody. Maybe it'll appear on our DVD shelves soon! August Pullman was born with a facial difference that, up until now, has prevented him from going to a mainstream school. 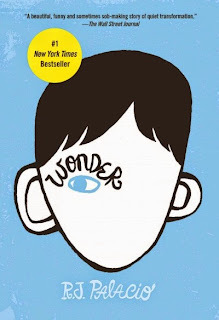 Starting 5th grade at Beecher Prep, he wants nothing more than to be treated as an ordinary kid--but his new classmates can’t get past Auggie’s extraordinary face. 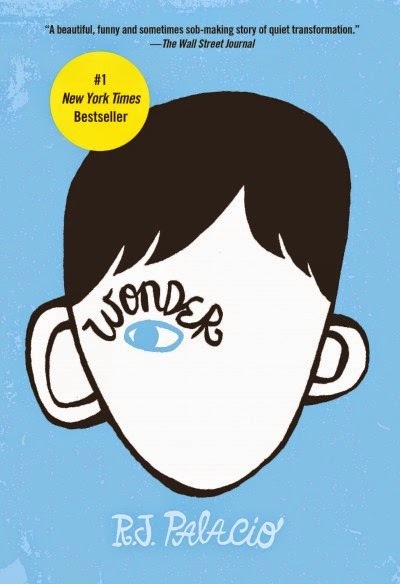 The fact that the book has won numerous awards, plus the fact that it's so popular with kids, leads one to think that maybe it is time for us adults to look at reading inclusively. By that I mean encouraging children to read about kids who are not exactly like themselves. By looking at the differences and recognizing the similarities in all of us, we can go a long way to becoming, and to raising kids who are, empathetic. Today, at 6:45 pm, is the vernal equinox. Spring officially arrives and not a moment too soon! Let's hope we've seen the end of the snow, and that what's left on the ground slowly melts so as to avoid burying us all in mud! Here's a poem by Wallace Stevens that is perfect for transitioning us. 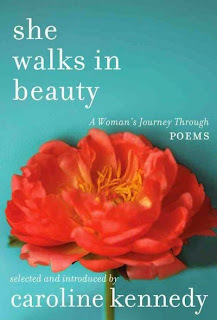 It can be found in She Walks in Beauty: A Woman's Journey in Poems, selected and introduced by Caroline Kennedy [808.81 SHE]. Head over to Reading to the Core where I'm sure you'll get a full dose of spring poetry! 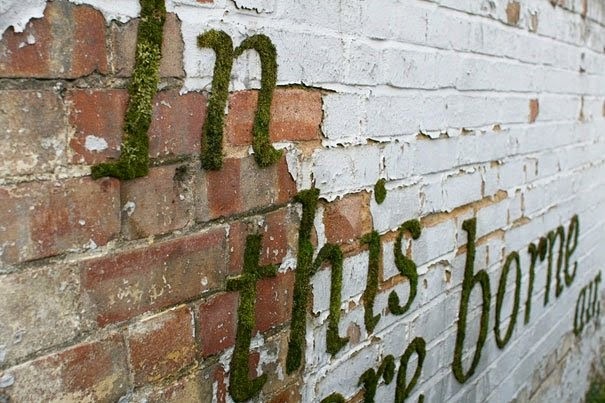 Now, to tie this into a book in our collection, I'm going to recommend a novel by Elizabeth Gilbert, The Signature of All Things [F GIL, AB/CD GIL, 3M ebook], a fascinating story of the adventures of a woman who studies moss! I kid you not. Spanning much of the eighteenth and nineteenth centuries, the novel follows the fortunes of the extraordinary Whittaker family as led by the enterprising Henry Whittaker, a poor-born Englishman who makes a great fortune in the South American quinine trade, eventually becoming the richest man in Philadelphia. Born in 1800, Henry's brilliant daughter, Alma (who inherits both her father's money and his mind), ultimately becomes a botanist of considerable gifts herself. As Alma's research takes her deeper into the mysteries of evolution, she falls in love with a man named Ambrose Pike who makes incomparable paintings of orchids and who draws her in the exact opposite direction, into the realm of the spiritual, the divine, and the magical. Alma is a clear-minded scientist; Ambrose a utopian artist, but what unites this unlikely couple is a desperate need to understand the workings of this world and the mechanisms behind all life. Now, while you still have a month or two to plan, is a good time to investigate landscaping projects for this upcoming growing season. With the success of cable network programs such as "Curb Appeal," people have become more attuned to the outside of their home. Cowell, Cressida. How to Train Your Dragon. [J COW] Hiccup Horrendous Haddock the Third must capture and train a dragon. Lowry, Lois. Gooney Bird Greene. [J LOW] A new to the school 2nd-grader likes to tell "absolutely true" stories about herself. Sachar, Louis. Sideways Stories from Wayside School. [J SAC] A classroom on the thirtieth floor of a strangely constructed school is the setting for many crazy stories. Vernon, Ursula. Dragonbreath. [J VER] Readers follow the adventures of Danny Dragonbreath (a young dragon) and his best friend Wendell (an iguana). Poetry Friday--Tomorrow is Pi Day! Each year on March 14, nerdy, and not so nerdy, types celebrate Pi Day! Pi is the ratio of the circumference of a circle to its diameter, which is 3.141592 etc. It is expressed by the π symbol. This year is extra special since it is 3/14/15 and follows the same number sequence as Pi. Two years ago BuzzFeed ran "24 Wonderful Ways to Celebrate Pi(e) Day," which is relevant for any Pi Day, including tomorrow. grass growing slowly over my shoetops. between moments, the measure left unmeasured. Ira Sadoff is from up the road in Maine. There is a lot of poetic talent in New England! Eat some pie, play with some numbers, read (or write) some poetry for Pi Day. Before that, though, visit Laura at Author Amok for the Poetry Friday Round-Up. The scrumptious apple pie photo is by Matman from Lublin, courtesy Wikimedia. March 12, 1922 marks the 93rd birthday of Jack Kerouac. Kerouac, as you probably know, was born and raised in Lowell, MA. He went on to become a novelist and poet before his death in 1969 at the age of 47. He is perhaps best known for On the Road [F KER], "the classic novel of the beat generation." If you've never read On the Road, you may want to start off with Jack Kerouac Reads On the Road [CD MISCELLANEOUS KER]. It consists of songs sung, and excerpts from the novel read by Jack Kerouac, with musical accompaniment. It was recorded in the 1950s and is on one CD, so is not the complete novel. We have the complete novel, also read by Kerouac, on 8 disks [AB/CD KER]. Now that the weather is getting better, it's time to go exploring. Lowell is a short drive away, and has lots of Kerouac-related points of interest, including his gravesite, which is always covered with little remembrance trinkets left by visitors. The National Park Service has background information on Kerouac, which you can access here. Click here for information about a self-directed walking tour of Jack Kerouac's Lowell. Check out Jack's Lowell webpage to learn about projects about Kerouac and Lowell. If you have money to spare, and you want to own a piece of Jack Kerouac history, his former St. Petersburg, FL home is on the market! Tomorrow, the Friends of the Library of Windham, FLOW, is holding a pre-sale of used books and materials, 3 to 6 PM, for FLOW members, teachers, and senior citizens. It is part of three days of the FLOW Library Luau and Winter Book Sale celebration! 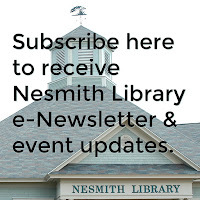 Money raised is used to provide events and to purchase materials beyond what has been allocated in the Library's annual budget. The items being sold at the book sale are gently used and generally published within the past 5 years. By Saturday, FLOW is hoping to have sold out, but if they don't, then, between the hours of 1 and 2 pm you can fill a bag for just $5.00! A bargain! If you're not already a FLOW member, you can purchase a membership at the pre-sale. It's win-win! The fifth season of Downton Abbey has drawn to a close, and it won't be until January of 2016 that we get to find out how Tom is getting along in Boston, if Lady Mary has found a suitor with a fancy motor car, and if Mr. Carson and Mrs. Hughes have tied the knot! If you missed any of the fifth season, or, if you've never watched the PBS blockbuster, we have seasons one through five on DVD [DVD DOW]. The illustration was created in honor of the 105th birthday of Ando Momofuku, the man responsible for the development of instant Ramen noodles! Ramen noodles have long been a staple of college students--the noodles are cheap and filling (but also loaded with sodium). Some awesome recipes have been created using ramen noodles, my personal favorite is a salad with crushed, uncooked ramen. It must be a favorite of others, too, because if you do a Pinterest search on the term "ramen noodle salad," you'll find a gazillion recipes (okay, only 71, but that's quite a few). In our collection we have a 3M ebook titled 101 Things to Do with Ramen Noodles by Toni Patrick. If you're a ramen noodle fan, you may enjoy it! On your next visit to Japan, be sure to try freshly made ramen noodles. There's a regional guide to ramen here, and, believe it or not, there's "the world's first food-themed amusement park"--the Shin-Yokohama Ramen Museum! Poetry Friday--Happy Oreo Cookie Day! A big fan of Oreo cookies alerted me to the fact that today is National Oreo Cookie Day! So, let's celebrate! If you have recently arrived from outer space, and you don't know what an Oreo cookie is, then hurry over to Wikipedia where there's more information than you could possibly want about a cookie! I went looking for an Oreo cookie poem for today and ended up on YouTube where I found a number of short videos of Oreo poems. I recommend the one by Tucker Bryant. Today is also the 103rd birthday of the Oreo cookie! 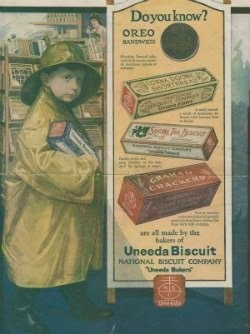 The advertisement graphic above came from a Duke University blog post on the occasion of the Oreo cookie's centennial. I suppose the very idea of dunking and eating an Oreo is poetry enough, so treat yourself to package and pour a big glass of milk, and have fun! 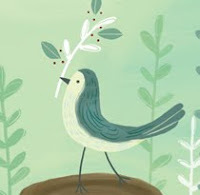 The Poetry Friday Round-Up is taking place at Robyn Campbell's blog. Stop by! We spend several hours a day sleeping. The exact amount that is best for us, has long been up for debate. However, if you can't fall asleep, then that can result in real problems--physically and emotionally. Here's something I read about recently that maybe you will find useful if you sometimes have trouble falling asleep--the 4-7-8 breathing trick. There are quite a number of picture books about sleep, and, counting sheep. 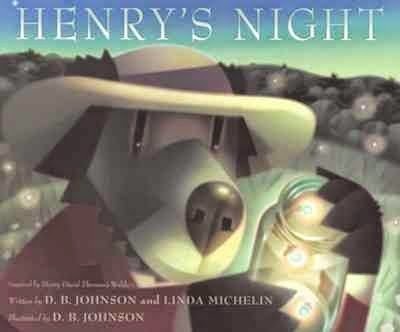 One that may hold some interest for adults is Henry's Night by D. B. Johnson (a New Hampshire author/illustrator) [JP JOH]. It is part of a series of Henry books based upon the writings of Henry David Thoreau, but, in the picture books, Henry is a bear! Boston is coming close to breaking its record of snowiest winter on record. The people of Boston have had over 100" of the white stuff. We, in southern NH, must be pretty close to that, too. Records can be a lot of fun for kids, they love little tidbits of knowledge that will wow an adult. It's one of the reasons why our Guinness World Records books are so popular [031 GUI]. The books are large format, with each page filled with photos and records. They're a delight to browse through. And, they may inspire a kid to dream about one day appearing in the record book. 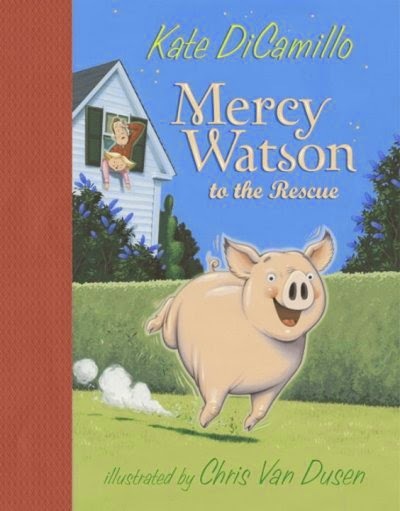 As you can imagine, there several works of children's fiction about record-breaking. 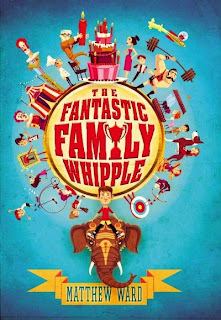 One is called The Fantastic Family Whipple by Matthew Ward [J WAR]. 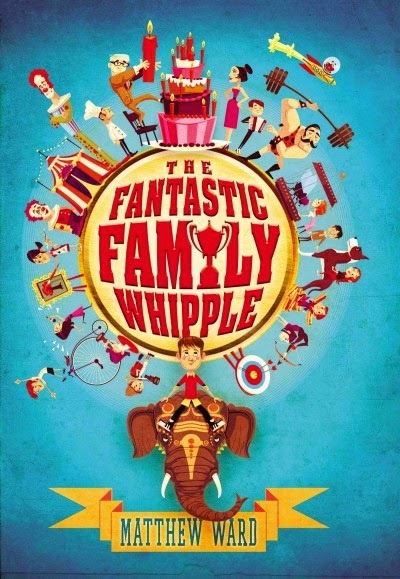 The main character, 11-year-old Arthur, is the only one in his family not to be a record-holder! Another is Ivy and Bean Break the Fossil Record by Annie Barrows [J BAR]. If March Is Here, Can Spring Be Far Behind? March arrived like the proverbial lion, with snow Sunday night, but yesterday was rather lamb-like with bright sunshine and a bit of warmth. We've always suspected that crows are smart, but how smart are they? Watch this video about crows that leave "gifts" for a young girl in Seattle. I have a fondness for crows, but some people, especially farmers, may consider them pests. It's too bad, since, in human beings' attempts at correcting "problems," they often make things worse! In California, crows have moved into urban areas, and are currently shaking up the people of Santa Cruz; click here to read more. Check out this older post about crows, and be sure to watch the short video clip!